2012, Armageddon, Y2k, and alien invasion scenarios all have a unifying thread. A presence, a power, or an unconscious process overshadows our choices and limits our reactions. Change is derived externally by forces so powerful that our individual responses become essentially meaningless. There is something seductive and alluring about this process that provides a sustaining energy for Fringe minds drawn to apocalyptic thought. So many aspects of our modern lives are beyond our individual control. The bureaucratic Beasts of government and multinational corporations are so removed from humanity that they seem alien and intimidating to any plebeian caught in the webs of regulations and soul-sucking phone trees that accompany our modern existence. Something seems wrong, but we cannot identify a specific cause or explanation. This alienation and nihilism, the perspective of Adbusters, metal and emo music, and despondent rebels everywhere seeps into the unconscious mind and likely contributes to the increased rates of depression in "rich" Western culture. Resonation with apocalyptic thought could be a projection of the unconscious desire to escape from the mediated prison that has been created around us. A powerful cleansing force of change is coming to reformat existence. Repent, and look busy! Is this resonation with apocalypse lazy thinking for minds that have given up the imposing task of taming or re-creating a world that has spun out of control? Does hope spring eternal, or is it inevitable that humans will be overwhelmed and reduced to mindless consumer automatons? 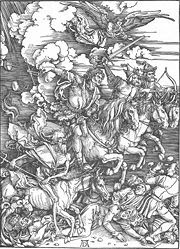 Does apocalypse bring divine judgment, or are we responsible for the situation we find ourselves in? Where is the true locus of control, and how do we communicate that to the asteroid/volcano/tsunami/black helicopter speeding our way?